Extra expense tracking may help steer your budget demands away from an online cash advance dependency. When you take out more than a few short-term loans each year, you will want to start finding a solution right away. Instead of paying the direct lender finance charges, you will keep that money for yourself. How do you back track? You start with old bank statements and any receipts you still have kicking around your purse, wallet, counters or desk. Highlight all checks, debits or withdrawals that are not associated with regular bill payments. Subtract any of these costs from that are linked to a current budget category. In other words, if you allow $100 per month on dining out, only account for any extra spent within one month’s time. Same goes for entertainment, gifts or miscellaneous cash. A great budget plan will account for it all, but most plans will not. Now look at your credit card statements. What charges did you make? If any of them were not accounted for within that month’s budget, add them to the pile as well. In fact, if you didn’t pay off the balance from the time before, you need to include the finance charge. This charge accounts for a good portion of your lost wages, especially if you own multiple credit cards. Did you take out a cash advance online loan or something similar? You have to include the finance charge from these as well. Add any application fee, extension charge or NSF fees accrued along the way. Hopefully if you found the best lender and make on-time payments, there will be no extra costs. Once you have tallied all the money spent on non-budgeted items, you will have a better idea of how cash is overspent within the budget. Now the hard part… stopping the habits. The good part is that you now have the basic idea of where you need to cut back. * Don’t carry credit cards around with you. This will limit temptation to overspend. * Keep a set amount of cash in your wallet each week. This is your budgeted spending money. If you run out… you wait. *Cut back in other areas in order to make a new spending category within your budget. Stick to the limit or you will see a repeat of money troubles. * Create an emergency savings account to have on hand. 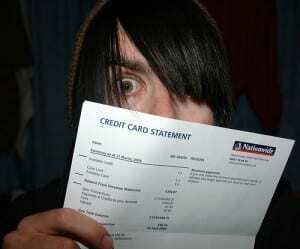 It’s better than returning to credit or cash advance borrowing options. You earn your income. You have every right to spend your money as you see fit. If the fit is creating problems, then you have to work at correcting it. Make it a permanent fix so you don’t have to worry about debt eating at your income. Refrain from over shopping the budget to make that happen. Don’t forget to learn from your mistakes! This entry was posted in Budgets and tagged budget, budget problems, Cash Advance, credit debt, debt problems, tracking expenses. Bookmark the permalink.